Who discovered Uranus, and what did he contribute to our understanding of the universe? The German-born astronomer William Herschel (1738–1822), who lived and worked in England most of his life, was an avid stargazer since his youth. Herschel was conducting a general survey of the stars and planets when, in 1781, he observed a disk-shaped object in the direction of the constellation Gemini. At first Herschel thought the object was a comet. But over time, he observed that its orbit was not elongated as a comet’s normally is, but was rather circular, like that of a planet. He wanted to name this new planet George, after King George III of England, but that name did not stick. Eventually, astronomers agreed upon the name Uranus, the mythological father of the Roman god Saturn. In 1787, Herschel also discovered the two largest moons of Uranus. 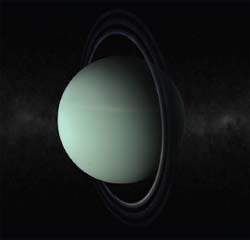 Uranus has multiple rings encircling it. Interestingly, the planet is tilted on its side compared to the other planets in our solar system. No one knows why this is, but a possible explanation is that during the formation of the solar system Uranus was struck by a protoplanet.